Newly proposed language means racing must prove its worth and decision makers should be prepared. There was some tepid enthusiasm from New Jersey racing (and its fans) Thursday as the $100 million ($20 million per year for five years) racing subsidy bill was advanced to the Governor’s office for signing. The bill provides a whopping $6 million per year for Meadowlands purses, $1.6 million to Freehold, and further cash incentives for Jersey-sired horses, as well as breeders. When we add this potential cash inlay to the already successful sports betting revenue numbers, things are surely looking up for the Garden State’s racetracks. Back in 1981, Ronald Reagan signed Executive Order 12291 which required policy makers to measure the costs and benefits of their actions to maximize efficacy. Cass Sunstein, who worked in the Reagan White House and was later Obama’s Head of Regulatory Affairs, explains much of this sea-change in his very-good book, The Cost Benefit Revolution. Its principles have stood the test of time, and governments use them each and every day. These items should be relatively easy to present at year end. Adding to that, I submit handle increases are extremely important. In the past in places like Ontario, slot-infused purses were a hit and hope strategy – more purses mean more races mean more handle – but I think this was deficient, and in the long-run, lack of betting interest was an Achille’s heel. Racing in Jersey needs to create a vibrant wagering plan, and there are smart things they can do to achieve handle increases. Racing attendance is a metric that can be beneficial to illustrate net benefit. According to studies, live racing increased slot machine use by 14 per cent, and similar should happen with sports betting — where the state gets a nice cut. Those are dollars directly into the government’s pocket. Direct impact on an economy is always important to detail when it comes to subsidy. With more horses being entered, are more horsepeople buying fuel, using more hotels for big race nights, and so on? Horsepeople surveys can help decipher what’s being spent in Jersey; money that would’ve been spent elsewhere. Green space in Jersey is a super-hot topic. Have any horsepeople or farms purchased land or expanded their land holdings because of the higher purses and a more vibrant industry? This needs to be surveyed, and then highlighted. An area of this world where harness racing has huge public support is Prince Edward Island, Canada, during Old Home Week. As many of you know, the month of August is packed with harness racing, and it drives a good deal of tourism dollars and goodwill. The public and politicians are fully behind the event, and sport. I believe Monmouth and the Hambletonian Society (along with the Meadowlands) have a similar opportunity. Haskell week and Hambletonian week are as good as it gets for both sports, and using them as public relations vehicles is likely money well spent. Not only is there measurable economic impact, there’s a qualitative community goodwill that can be harnessed. I believe it can make a difference. For many years, harness racing’s responsibility with subsidy seemed to lie solely with putting on races and cashing purse checks. I think that ship has long-sailed. 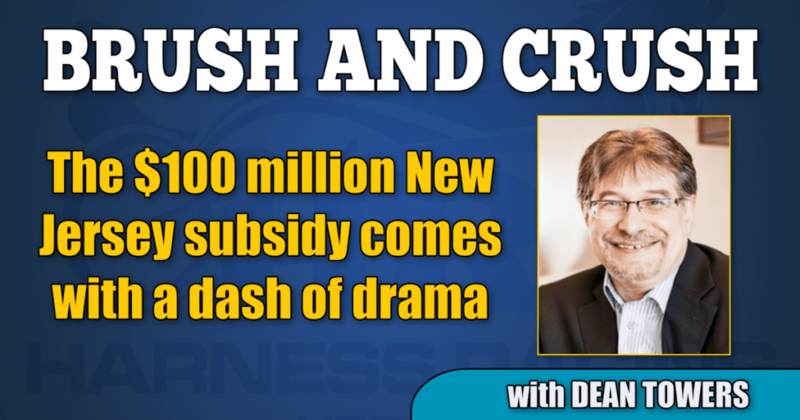 If New Jersey racetracks and horsepeople want this new subsidy to last (and in five years passed again for another five), there’s a task at hand – setting the table to illustrate how this money will work. Governments don’t speak horse racing (and probably never have) so horse racing must speak government. In my opinion, that’s job one.